Patrice Michaels Bedi's singing career is looking up, thanks to a new relationship with an enthusiastic record label. Soprano Patrice Michaels Bedi didn't take up singing seriously until her senior year in college, a late start for any classical performer. Now, some 20 years later, she's pleased with her career choice, though at times she bemoans her status as, she says, a "second-tier, regional singer" still looking for a lead role in a major opera. "I'm not losing sleep over this," she quickly adds. Her fans think she deserves a break. "Patrice certainly has the talent, so it boils down to luck," says Jim Ginsburg, owner of Cedille, the classical label that has featured Michaels Bedi on six CDs, including its latest release, Songs of the Classical Age. "There are lots of bigger names who don't stack up to her, yet you see them at the Lyric again and again." Divadom was far from her mind when she entered college in her native southern California. She wanted to be a flutist. Then, after a false start, "I figured out that I really wanted to be a composer." She ended up with a degree in theater from Pomona College, where she learned how to coach voice for musicals and operas. "The singing bug really hit me when I got to grad school," she says, recalling her two years as a member of a music theater ensemble at the University of Minnesota. "I sang in The Merry Widow, Carmen, and other classics like those." She also wrote adaptations of The Trojan Women and A Midsummer Night's Dream, as well as an original opera under Dominick Argento, a composer whose lyrical work she'd later champion. Her voice blossomed during a postgraduate residency in musical theater at the Banff Centre for the Arts in Canada. "I knew I had the unusual ability to do all that runny bit up and down the scale," she says. This gift got her plenty of invitations to audition. She also toured the western provinces in another opera she'd composed. All the while, however, she had her sights set on returning to the States. She wound up in Chicago in 1984 thanks to a misunderstanding. While at Banff she auditioned for Lee Schaenen, then the director of the Lyric Opera's Center for American Artists, that company's well-regarded apprenticeship arm. She thought she had a shot at a slot in the center's incoming class, but when she showed up in town she learned there was no opening. "A singer already in the program was asked to stay another year, effectively bumping me off," she explains. The consolation prize was the chance to understudy a coloratura role in that season's production of Arabella starring Kiri Te Kanawa. Though disappointed, Michaels Bedi decided to stay and adopted Schaenen's wife, Nell, a teacher of Italian diction, as a mentor. Another mentor emerged the following year, when she joined the choral and orchestral ensemble Music of the Baroque. Tom Wikman, the group's founder and music director, had not only coached his chorus to prominence over the years but also developed many singers into specialists of the bel canto style--the hallmark of Baroque vocalism, demanding flawless technique and profoundly expressive phrasing. "I worked my way up the Wikman ranks until I got to sing solo in Dido and Aeneas," she recalls. "I didn't really know how to sing until I met Tom." Her affiliation with the ensemble continued until 1995, and next spring she'll return to reprise the role of Dido under Wikman's direction. Through Music of the Baroque she met keyboardist David Schrader, who accompanies her on three of the Cedille CDs. "I think she came into her own when she sang with [now-defunct] City Musick in the late 80s," he says. "That voice of hers was amazingly agile and dead-accurate in the Mozart C Minor Mass. She proved then that she's a true Mozartean." While going through rounds of auditions hoping for a chance with a major opera house, Michaels Bedi also started a family. She married an Indian entrepreneur in 1986 and had a son one year later. Juggling child rearing and a career is daunting for anyone, but especially for freelance musicians, who must accept out-of-town jobs in order to make ends meet. While she was single, Michaels Bedi had worked as an office temp--"I've always been a useful kind of gal and I pick up new things quickly, so I'm asked back a lot"--but managed to earn the bulk of her income from music; now she had to factor in the logistics of running a household. For several years she laid low, content with family life in Lincoln Square. She accepted gigs mostly in the Chicago area, though she did venture out now and then, making her Cleveland Opera debut in the 1990-'91 season as Marzelline in Fidelio. She also had another son. Jim Ginsburg first heard her sing at a recital with the Rembrandt Chamber Players in the fall of 1991. She sang Argento's "Six Elizabethan Songs" and Ginsburg, who planned to record Rembrandt's "20th-Century Baroque" program, was favorably impressed. During the recording sessions a couple months later, "I got to spend more time with Patrice," he says. "She was all poise and knowledge. I knew right away that I wanted to showcase her on my label, so I proposed some sort of recital album of songs to be chosen by her." Thus began the type of partnership between an artist and a label that's the envy of even the most established musicians. Ginsburg loves classical music--from Baroque to modern--knows its arcana, and he plays piano. As an undergraduate at the University of Chicago in the early 80s, he'd toyed with majoring in music, but abandoned the idea after lessons with DePaul University pianist Dmitry Paperno "failed to fix me." He opted for the U. of C.'s law school instead, resigned to following his family's legal tradition--Ginsburg's mother is Supreme Court justice Ruth Bader Ginsburg, his father is a tax lawyer, and his sister is a law professor at Columbia University. In his first year of studies, on a whim, he produced a CD featuring Paperno in solo pieces; the experience was so gratifying that he took a leave of absence to see if he could make it as a record producer. He founded Cedille in 1989 and several CDs later realized he'd found his calling. "I take the worries from the musicians," he says. "I speak their language, and I have the patience and know-how to listen to all the tapes and find the best cut. Why should the talents waste their time slogging through the material when I can do it for them?" Cedille has put out 49 CDs in the last ten years and has plans for at least 7 more next year. Though sales have averaged about 2,000 copies per album, it's not a figure to snicker at in the rarefied world of classical music. 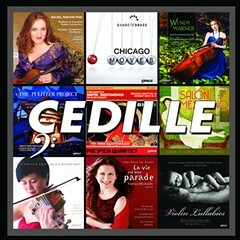 (Cedille's CD of violinist Rachel Barton playing Handel is its best-seller so far at 5,600 copies.) The bottom-line-conscious Ginsburg--who often travels with a tote bag of his CDs ready for an impromptu sale--has kept the cost of each CD down so that he can continue his risky policy of sticking exclusively with Chicago performers and composers. "We switched to not-for-profit status five years ago--this way we're able to get foundation grants," he says. "Still, this is a tough business. I'm making decent money but not nearly as much as an associate gets at a blue-chip law firm. But mine is a mission to go beyond the superficial in classical music. I'm nauseated by CDs with titles like 'Mozart for Babies' and 'Bach in the Bathtub.'" Michaels Bedi's first recital CD on Cedille, Songs of the Romantic Age, came out in 1994, a banner year for her. She had a major part in Menotti's The Medium for Chicago Opera Theater (available on Cedille). And she made her Lyric debut in Hal Prince's staging of Bernstein's Candide. But her recital debut in New York--a calling-card engagement designed to generate buzz and lead to an agent or a manager signing on--fizzled. "The New York Times didn't cover it," she says, "so all the effort went to naught." Undeterred, she came back to Chicago and today she's as busy as ever, a regular with first-rate local choral groups as well as orchestras in Minneapolis and Milwaukee. Her calendar got even more crowded that fall, when she accepted a professorship at Lawrence University Conservatory in Appleton, Wisconsin. "I enjoy teaching enormously, but the logistics of commuting are wearying," she says. "Unlike some other singers, I just don't have much of a support system--physically, financially, and emotionally." While her kids stay with her in Appleton when school is in session, her husband remains in Chicago, where he edits and publishes the Indian Reporter, a news weekly for the Indian community. "On the other hand," she says, perking up, "I've been improving vocally. And as my artistry gets better, what drives me is high-quality musical experience. I'm turned on when everything jells." Her repertoire ranges from early music to contemporary opera. "She's very knowledgeable," enthuses David Schrader. "A fine musician with a fine voice. Easy to work with. A musicians' musician, in fact. Her dilemma is that she has the sort of voice that's hard to classify. The early-music crowd might find its vibrato and volume more suited to post-Baroque operas, yet opera managers might believe that it's not big enough for a large house. That's a shame, because she ought to be better known." At this stage in her career, Michaels Bedi is no longer burning with youthful ambitions. But her friends constantly ask her to perform with them "in works that are meaningful to me." She can indulge herself with a variety of songs, ranging from Mozart to Bellini to Ellington. She's been favorably recognized by national critics, and she records regularly, even on labels other than Cedille. And then there's Ginsburg, for whom she'll soon record arias from Mozart's Vienna, including a newly discovered recitative. "I've chosen a road less traveled, picking family over New York," she says. "I don't regret a minute of it, and there's always composing to fall back on. When my voice begins to decline--and I hope a long time from now--I can write for other singers."